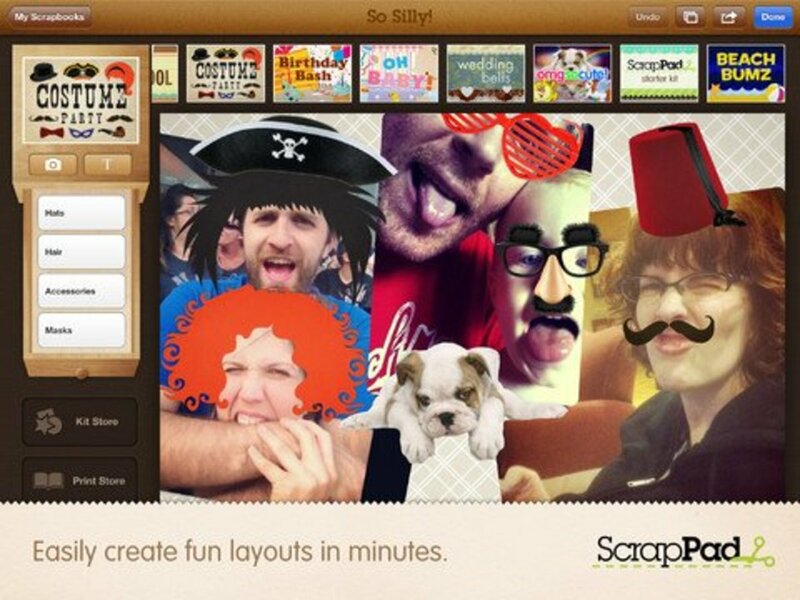 Hey Scrapbooker, Card Maker, and Paper Crafter! Did you know that "going green" is not only good for Mother Earth? That's right—it's also good for your pocketbook! This article offers tips for reusing, recycling and making your own environmentally friendly scrapbooks and other green arts and crafts projects. I know these tips work because I have made every one of these items myself. If you have an eco-friendly tip to add, please leave a comment. 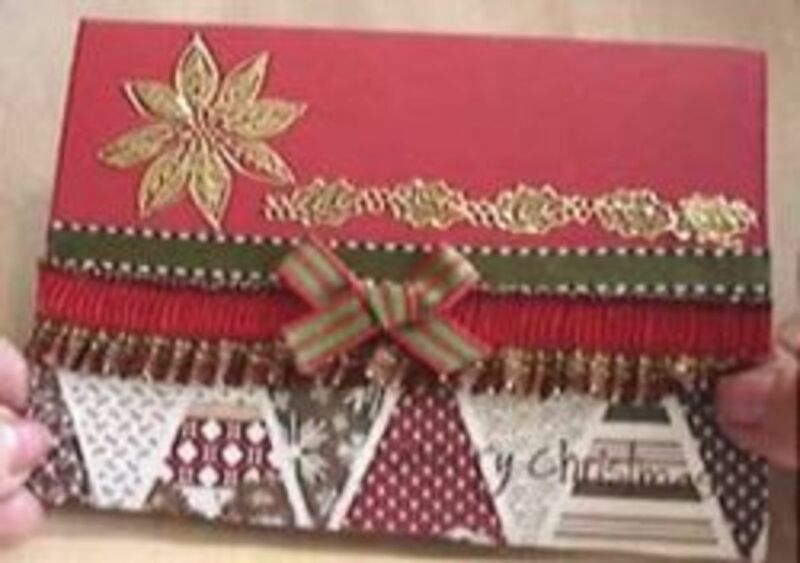 Tips related to card making, stamping, altered art, mini albums, decorations and the myriad of other projects that fall loosely into the scrapbook category are welcome. Calendars, catalogues, and glossy folders make great envelopes. If you already make your own cards, you know that finding the right sized envelopes can be a challenge. Why not make your own envelopes, using paper that you have around the house? Old calendars are perfect. So are many catalogs, brochures, and assorted advertising materials that show up in your mailbox daily. 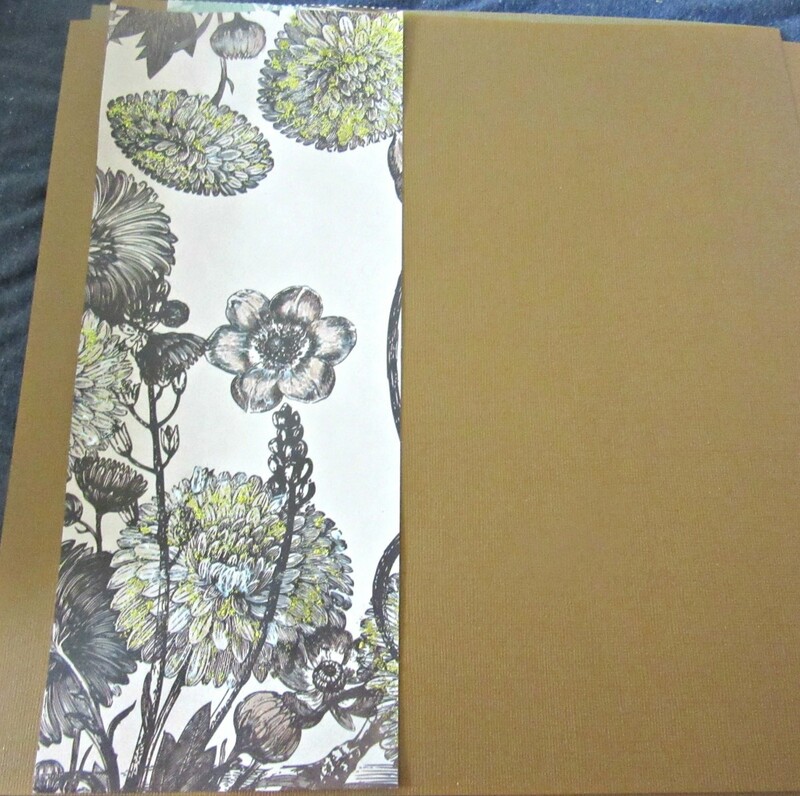 You can also use wallpaper samples or leftover strips of wallpaper, brown paper bags, packaging material or most anything else that folds easily. You don't need a pattern. You simply wrap your card as you would a parcel, and shape a flap. You will need to use labels for the "To" and "From" data. I print my From labels from the computer using Avery labels. For the recipient's address, I attach a strip of plain paper and write the address by hand. In the picture, I have not yet attached the recipient's address, but you can see the return label quite nicely. Children's board books convert into clever, imaginative albums or journals. 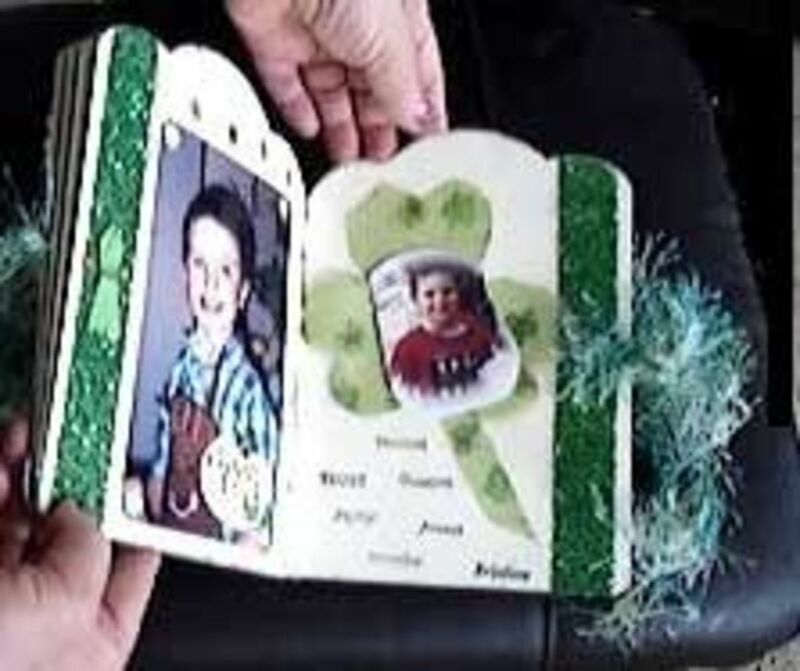 In this project, I turned an unwanted ' board book into a St. Patrick's Day mini album. It was a gift for a child. 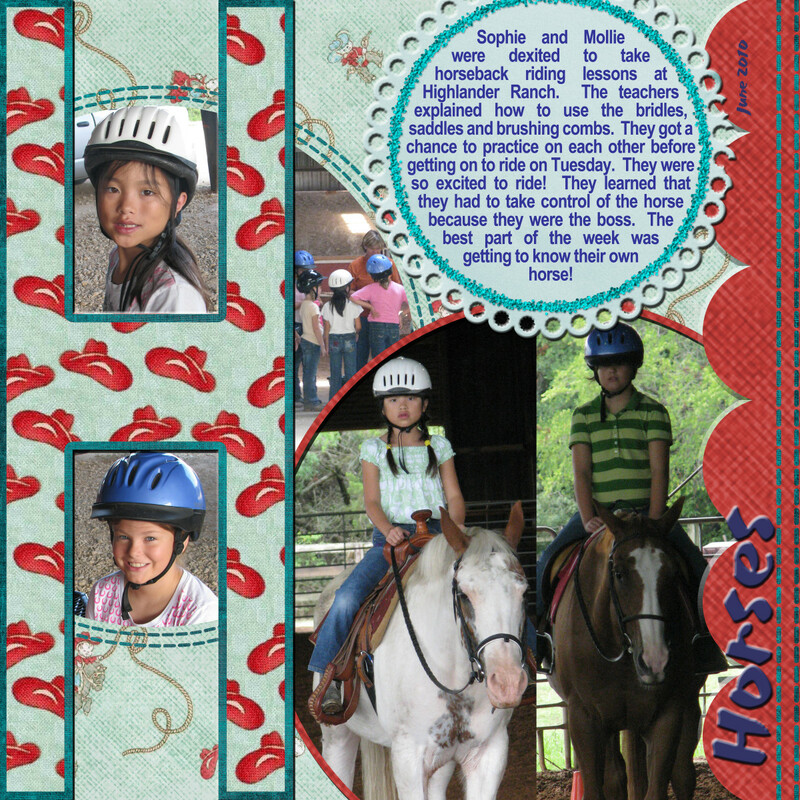 Board books work well for this type of project, but you can use other types of books too. Using recycled books is called making "altered books". The good thing about altering a discarded book and converting it into a scrapbook is that you are saving the book from the trash heap while avoiding buying or making a new book or journal. There is one word of caution, however. Books are not acid-free. I would not advise using this type of album for heritage pictures or for memorabilia that you want to save for a long time. The video here demonstrates how I made the altered book album. This was my first attempt at a video—I managed to improve over time. Take a quick peek at the picture at the top of this lens. I made the wall hanging using cardboard inserts that came with new cookware. 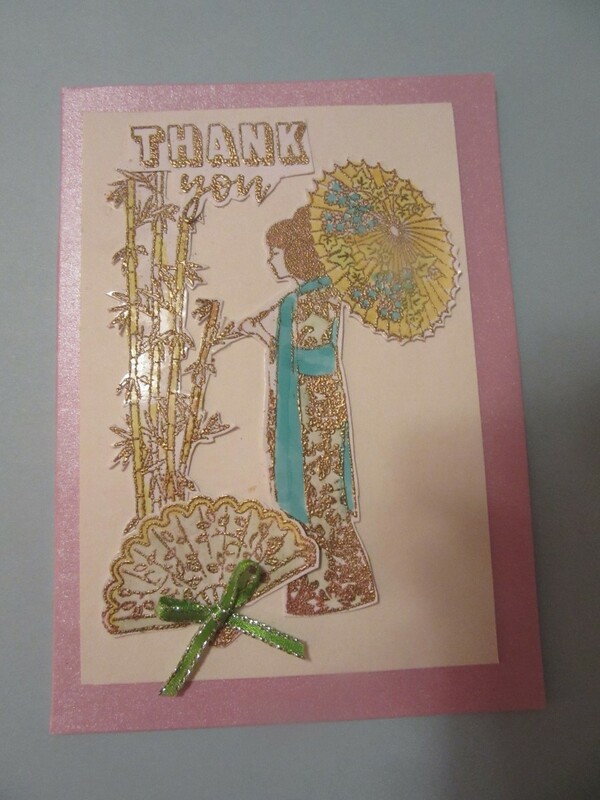 I painted the cardboard, glued a picture from a greeting card in the middle and trimmed with paper flowers and ribbon. It's an attractive wall hanging in real life—no-one ever guesses its hand made from junk. Be alert and keep your eye open for unusual items that you can use to create green arts and crafts projects. If you create your own handmade greeting cards, this tip will save you time and money, and is a more eco-friendly solution. 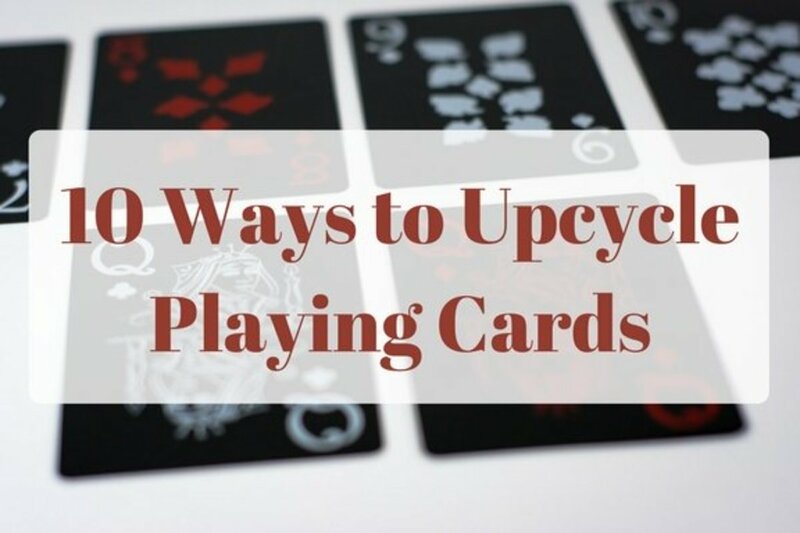 Use the cards that you receive from others (except for the ones you save for sentimental reasons, of course). Cover these items with papers, embellishments, and trim. 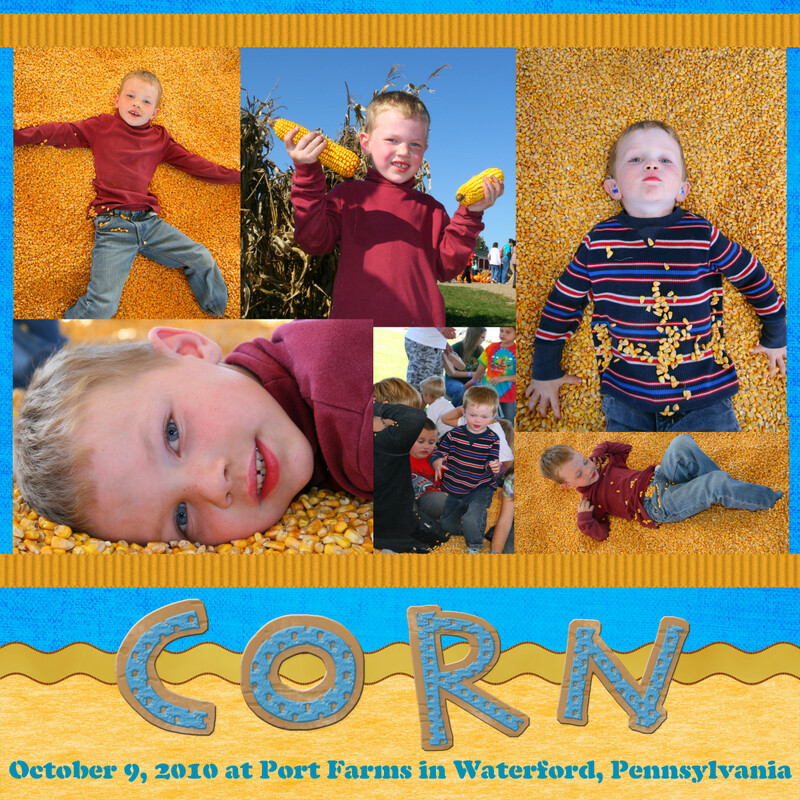 Be sure to conceal any images or text that appears on the original card, both inside and out. Alternatively, you can purchase a box of cards at the Dollar Store and redecorate them. This way, you get the envelopes as well. Naturally, you are not limited to holiday or Christmas cards. Messages for any occasion work as well. 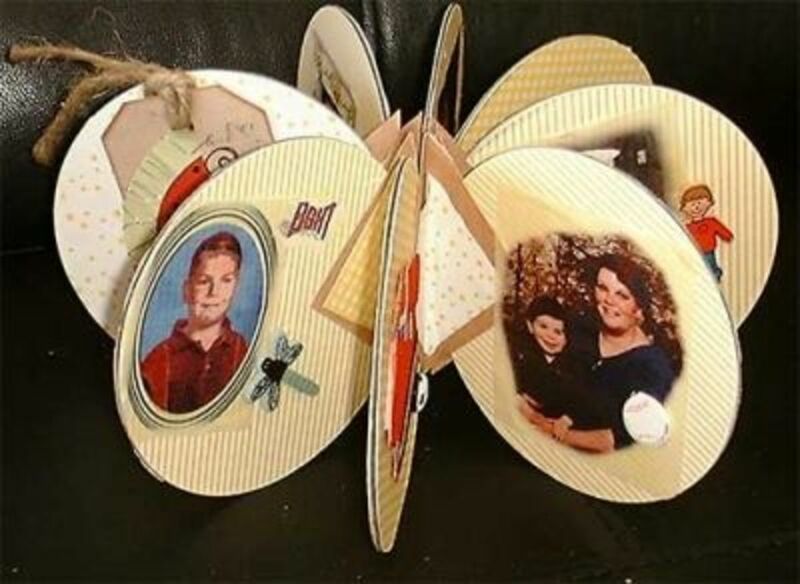 Old CDs and DVDs are like gold to those who create altered art, as well as other crafters. Save all you have and ask your friends to give you their old ones as well. In the big picture above, I made a stand-up photo album using eight CDs. I have seen these CD albums made using as many as 16 disks. The album closes to lie flat or you can stand it upright and fan it open like a flower. Similarly, you can convert CDs or DVDs into lovely photo frames. 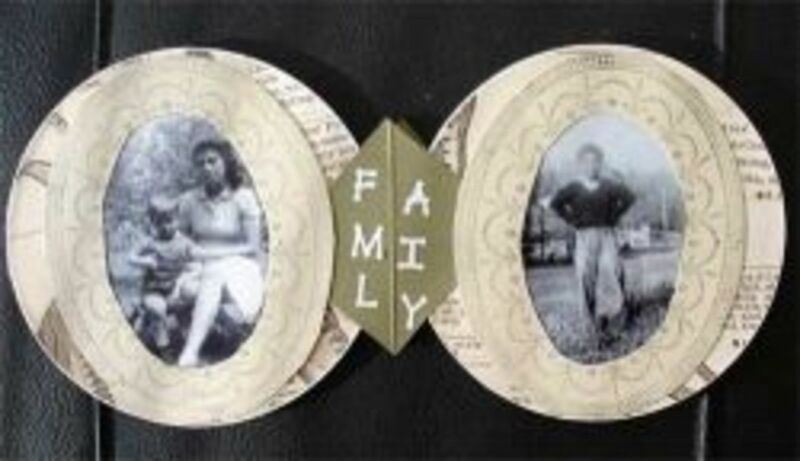 In the picture here, I have used two CD disks to make a heritage photo frame. Wear them or use them as embellishments. Recycle your CDs and DVDs to make brooches, earrings or embellishments for your artistic projects. You will need craft paint, a stamp and ink, Ultra Thick Embossing Enamel (UTEE) and a pin for the back if you are making a brooch. Brooch pins are sold at Michaels and other arts and crafts stores. Heat the CD in boiling water to soften it a bit. Then, using old scissors, cut or break the CD into irregularly shaped pieces. Be sure to protect your eyes when you do this. Little pieces can fly around when the disk breaks. Paint the front of the CD piece with any color craft paint. Allow the paint to dry thoroughly. 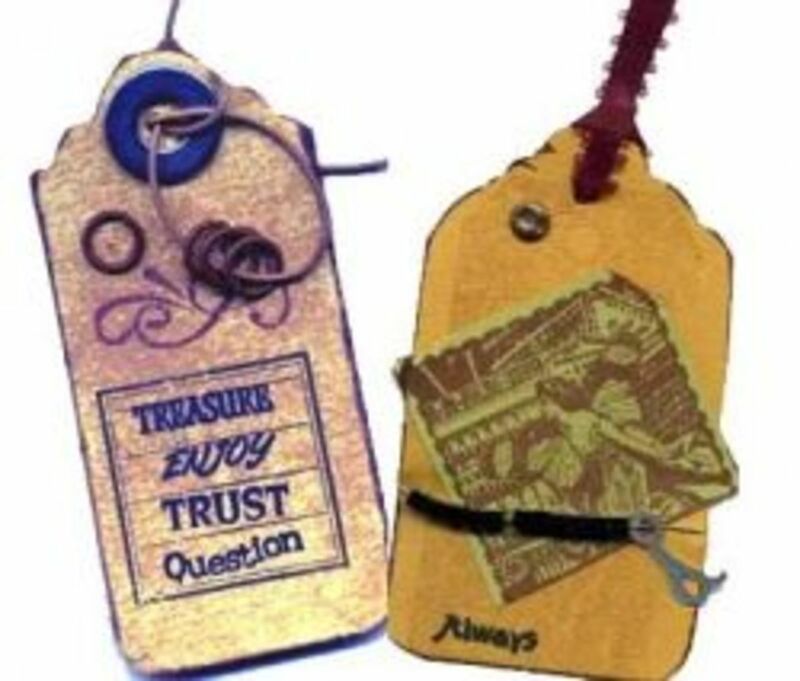 Stamp an image on the dried surface, using all or part of a stamp. Allow to dry. Apply two or three coats of clear UTEE to the CD piece. Allow to dry, or while the UTEE is still melted, you can stick in some tiny beads or sprinkle with glitter. If making a broach, attach the brooch pin to the back. This is all about hardware put to good use. In the tag art shown, I have made two grunge-look tags. They are decorated with pieces of cord, metal chain and little metal washers. @anonymous: Thank you so much for visiting and commenting. You have inspired me to start going greener! Thank you. I think, it is high time to use recycle material. Cost of these recycled material is smaller than others. I am experienced person of the packaging industry and i know importance of recycled cardboard. Not in just packaging industry, this thing is useful for all purpose. Lots of creativity here!! Love it all! @JJNW: Thank you so much. I am thrilled to receive your blessing. 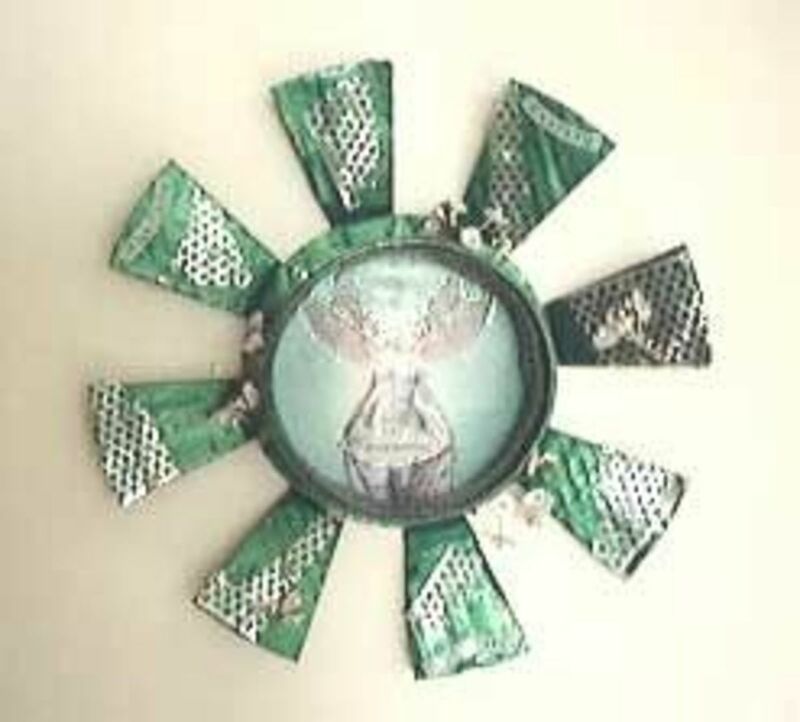 *** Blessed by a the Craft Ideas SquidAngel *** for excellence of ideas, instruction, content and all-around green wonderfulness!! me too!! I love how you re-use the CDs.. Great Lens and Congrats on the lens of the day!! That is a great achievement! @rasik-life: Thanks. Yes, CDs have so many great uses to crafters. Thanks for commenting. @lasertek lm: Thank you! Yes, junk materials have the added benefit of being both unique and cheap! In fact, most are free. @Dorsi: Very true. I have even asked my friends to save trash for me. Selected trash, of course. Great collection of ideas. I love making things out of "junk". One persons trash, another persons treasure as they say! @paperfacets: Thank you! I live in an apartment and there is no compost bin, but add my scraps to the recycling paper bin that we have in the building. This is a great collection of ideas! Happy Earth Day. Blessed by The HorseAndPony Angel, http://www.squidoo.com/horseandpony-squidangel. Happy Earth Day and congrats for a fitting lens tribute to living and crafting "green." Good practices and ideas. When my small paper scraps are not reusable I up them in the compost bin. I am known to use strips of paper 1/8" wide. Balloons and confetti for a perfect LotD for Earthday. @Tarra99: Thank you for visiting and your lovely rating. @coppertantrum: Thank you for dropping by and for your kind words. @RhondaAlbom: Thank you so much for your gracious comments. @Heather426: Thanks so much for stopping by and posting. Beautiful! I love the grunge tags and the recycled envelope will help me greatly! Thanks! Congrats on LOTD - well deserved. fantastic ideas and beautiful! congrats on LOTD! Congratulations on your LOTD. Very nice lens. @anonymous: Thanks Deb. What a nice thing to say. Thanks for visiting. @norma-holt: Thank you. Squid Angels are the best. @GonnaFly: Thats a great idea. I do iris folding as well. I'll be sure to check out your lens. This ideas are fabulous! What a treasure chest for my kids and I!! We are so inspried. Thanks for sharing all of your great ideas. 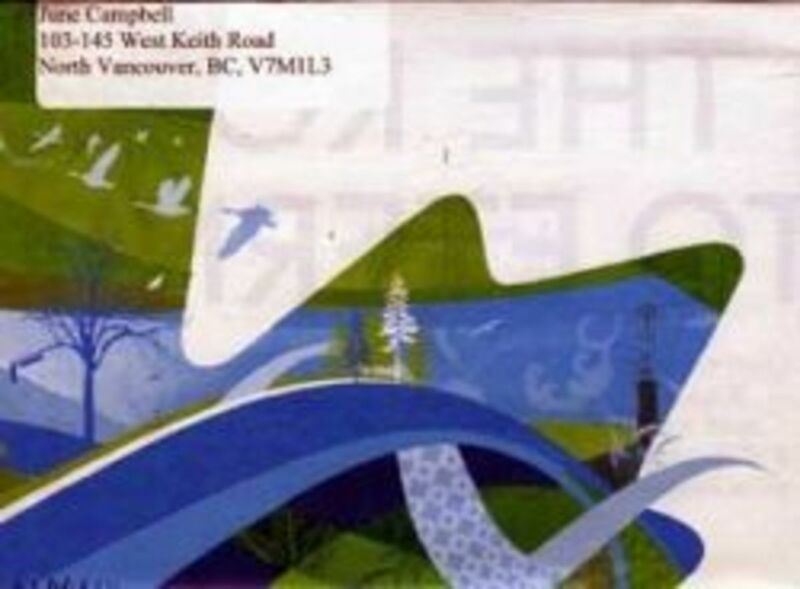 I use the insides of old envelopes to make cards (shown on my iris folding page). Another way to recycle "junk" paper. Great lens! 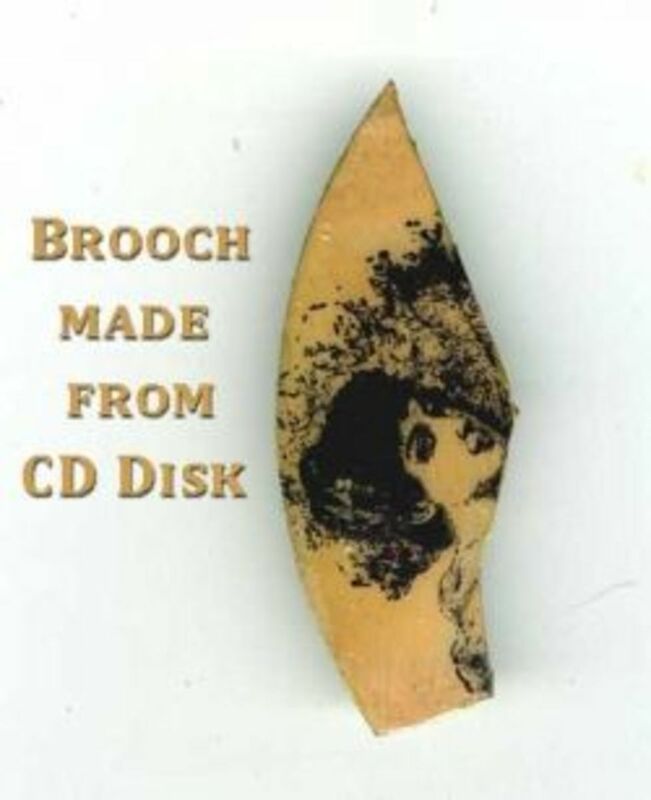 I have seen some brooches made from CD's in our Art Museum. Thanks for telling me how I can use CDs and DVDs for something other than drink coasters! For that you get a blessing from this SquidAngel! @Amy Fricano: Your art sounds fascinating. I'll be checking out your lenses. Thanks for commenting. @noxid25: Thank you! And Happy Earth Day to you also,. @KeithWinter: Hey, what a great idea. I'd love to see a picture of those earrings somewhere. Thanks for posting. @anonymous: Thank you J and the FFIDS. I take it you are all having a good day? One person's trash is another's treasure. Very creative ideas for recycling and making keepsake gifts. By the way, I loved your video. Congratulations on LOTD for Earth Day! loved it. I don't scrapbook, but you gave me some great ideas for stuff I make art objects that I call "Arbage Garde" art (avant garde made with would be garbage, with a touch of pigLatin). eat-gray! 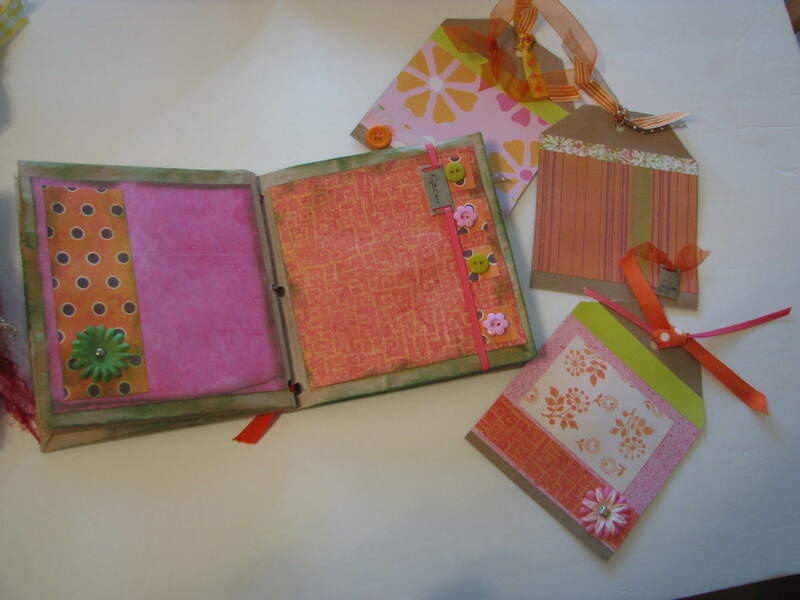 I love to scrapbook and these are wonderful green ideas. I like to re-use wrapping paper and only use paper made of recycled goods. Featuring on my facebook page today. Happy Earth Day and congrats on LotD. Great lens. I was at a party a few months ago and one of the guests was collecting the ring pulls from beer and cola cans. I asked her what she was doing and she showed me her earrings, bracelet and necklace. They were all made from ring pulls. She has started a craze amongst our friends. It's difficult to find ring pulls these days!! @ZenandChic: Thank you so much. Will lensroll as well. @verymary: Many thanks for stopping by and your kind comments. @JenOfChicago LM: Thank you so much. Always love Squidangel Blessings! Great lens! Blessing it and lensrolling to my Being earth friendly lens! fitting lens for Earth Day! @Rachel Field: Thank you! Perhaps you will try it yourself? @Ecomum: Thank you! Perhaps you could do the same if you knew the techniques. All of us went through a learning curve where we attended classes or studied books and learned how to do these things. @anonymous: Thank you kindly! And good luck with your weekend project. I hope you will post a picture somewhere and share it with us. @puzzlerpaige: Thank you! Envelopes are fun, aren't they? @Faye Rutledge: Thank you for visiting and commenting. @modz: Thank you for visiting! @stacy mcdaniel: Thank you! I had not realized I was LOTD -- wonderful! And thanks for commenting. Congratulations on lens of the day. I like the idea of using old DVDs for picture frames. Good Tips! Very good lens. Congrats !!! Thanks for the great tips! Congratulations on LotD!! Oh, I love making envelopes. They always turn out very interesting. These are some really neat ideas. Congrats on LOTD! Very nice work. Congratulations on LOTD! Good work......................keep it up, I gave it 5 stars. great idea and great LOTD! as an artist I do a lot of recyle art and love the challenge...great info and ideas here! This is a wonderful lens! I love your Green Scrapbook Tip #2. Make an Album from an Unwanted Book. I'm going to attempt my first one this weekend with my son...using an old board book of his choice. Thank you for such great (and Earth-friendly) ideas. 5* and a huge ((HUG)) from me. Congrats on LotD. You are an inspiration! I wish I could same, but I can't. At least I can be inspired with this lens. Nice, and by the way, Congrats on LOTD. Great Lens - I really like the DVD photo frame idea. @Rachel Field: Thanks! I appreciate you stopping by. Great ideas! I especially love the CD brooch idea!